Russia has not received any official requests from Ukrainian authorities concerning former President Viktor Yanukovich, but if such documents appear the reaction will be in line with Russian and international law, Yuri Chaika has said. 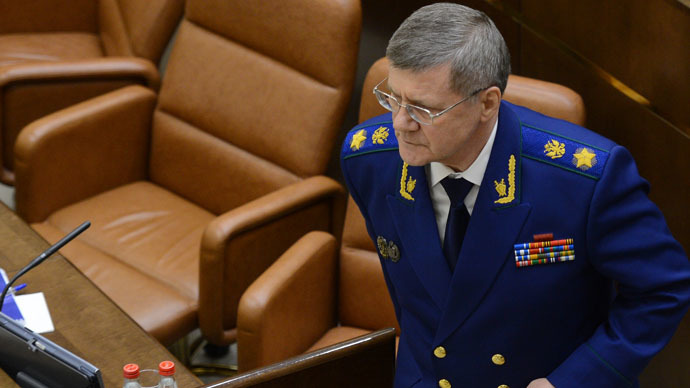 The Russian prosecutor general gave a major interview to Russia’s government daily Rossiiskaya Gazeta, where he stated his agency had never received any official documents concerning the extradition of Viktor Yanukovich, or any other Ukrainian politicians. Chaika said the Russian Prosecutor General’s Office maintained all necessary contacts with their Ukrainian colleagues, noting that since the beginning of the Ukrainian crisis both agencies have received and considered various requests for assistance. The comments were apparently prompted by the claims of Ukrainian Prosecutor General Vitaly Yaryoma, who in December last year accused Russian law enforcers of ignoring extradition requests concerning former Ukrainian officials who had fled to Russia. According to the Ukrainian official, there are 22 of them. The new Ukrainian authorities have initiated about 30 criminal cases against the country’s former president and impounded property that belonged to Yanukovich, his allies or companies allegedly connected with certain former officials. Interpol has put Viktor Yanukovich on its international wanted list, according to a notice published on its website. Charges against the former official include misuse and embezzlement of state property.